Collect a total of over 4,000 candies. Defeat a monster in combat with a friend by your side. Use the Robot Costume to Boost off of 15 different ramps. Get the jump on 10 different monsters by pail bashing them to initiate combat. Win the Autumn Haven Mall Costume Contest. Use every Costume Ability in battle. Complete all Quests in the game. Collect all Creepy Treat Cards. Win all prizes in Bobbing for Apples. Use the Pirate hook on 5 unique ziplines. Complete all quests in Repugia. Find the mysterious visitor in the cliffs of Repugia. 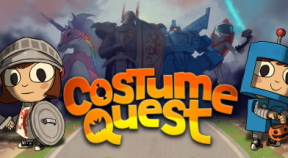 Play Costume Quest on Christmas.